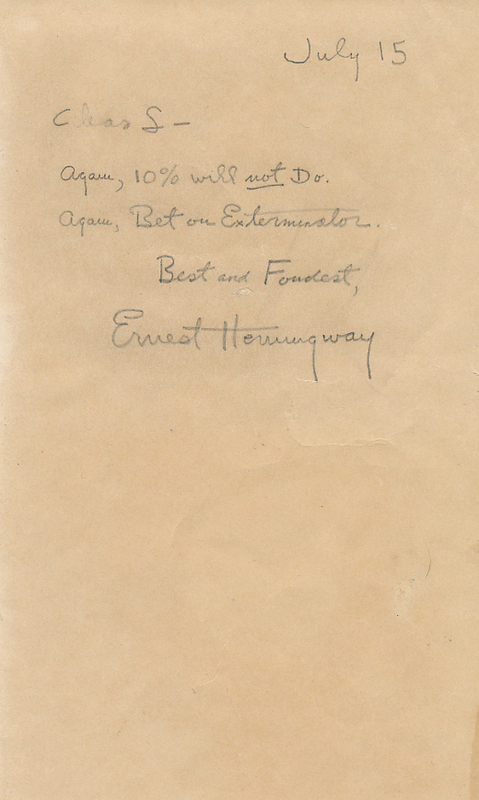 A brief note from Ernest Hemingway to his publisher, Charles Scribner, written at some point in the mid-1920s. Not happy with the terms of a proposed new deal between the two, Hemingway chose to remind the publisher that he was in fact the fastest horse in his stable of authors; Exterminator being the name of a particularly successful racehorse of that era who is still regarded as one of the best of all time. Indeed Hemingway stayed with Scribner until his death, so it's safe to assume that the unsatisfactory percentage was increased. Again, 10% will not Do.